By Jordyn Grzelewski | January 21, 2018 at 12:05a.m. When first-time customers walk into The Chocolate Shoppe, they’re offered a sample of the confectionery’s handcrafted treats. First, their teeth sink into rich Belgian chocolate. Then they taste the homemade filling nestled inside – perhaps it’s a sweet blueberry filling or a fresh ganache. By the time they’ve finished eating that first chocolate, “They’re hooked,” said Zak Woolley, who runs the shop with his father, Chris. The store, located at 850 E. Western Reserve Road, opened in September after the Woolleys, of Mineral Ridge, took over the space from another chocolate store previously located there. Both are new to the chocolate business, but are learning the right ingredients for success. “We had no experience. I kind of just learned on the fly,” Zak said. Perhaps most important is the chocolate the shop imports from Belgium. Or maybe it’s the wide variety of fillings: coconut, strawberry, whiskey, mango, black cherry, Belgian milk or dark chocolate, vanilla bean and blood orange, to name a few. The handcrafted pieces come in sets of three, six, 12 or 24, ranging in price from $5 to $30. With different fillings and molds, Zak has the chance to get creative. He works in a kitchen separated from the chocolate counter by a clear glass window. He demonstrates by pouring melted chocolate from a machine into a mold, scraping off the excess liquid. 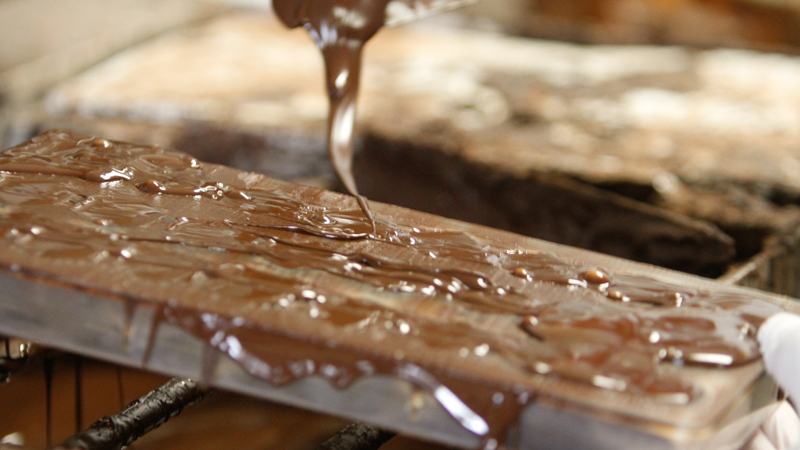 The chocolate sits in the molds before being flipped over – then, Zak pipes in one of the homemade fillings. Most are a combination of cream, sugar and a fruit puree. The mixture is boiled, then added to the chocolate and put into a mold. After a brief refrigeration, the chocolates are done and added to the day’s selection behind the counter. He cuts open a vanilla bean, scrapes out the seeds, then uses the bean to make a batch of chocolates. In addition to filled candies, The Chocolate Shoppe offers candy bars and chocolate-covered treats, including Oreos and pretzel sticks. Customers can choose various toppings – such as coffee, almonds or pistachios – for each. Whatever treats customers choose, they sometimes will tell the store owners that The Chocolate Shoppe’s chocolate is the best they’ve tasted – and that’s exactly the reaction the owners hope to inspire. The store is open 10 a.m. to 5 p.m. Monday-Friday, and 9 a.m. to 4 p.m. Saturdays. For more information, visit thebelgianchocolateshoppe.com or call 330-953-0255.